It's dreadfully warm over here today. In this warm weather soy milk is a very good beverage. Soy beans are a ying or cool food. Drinking soy milk especially cold can sooth the throat and body in this warm heat. Chinese drink soya milk hot, warm and cold, sweetened, with salt or plain. Chinese soy milk is usually slightly thinner than some of the local western supermarket brands soy milk in a cartoon. Years ago I used to like soy milk sweetened now I make and drink it without sugar. I never put soy milk in tea or coffee find it odd tasting, don't mind having it with cereal or make chocolate milk. I seldom buy ready made soy milk. DIY soy milk is quite easy. There are soy milk machines you can buy now that extracts and boils the milk for you, all you have to do is add soaked beans and water then comes ready to drink soy milk. These machines are not cheap though. I still use the same old method my mum taught me with a liquidiser and a strainer. Liquidiser better buys one with large jar size and decent power because the more powerful the machine the finer and quicker it pulverises the beans and giving more/thicker milk. I bought this Philips liquidiser last year, it's was at half price and I find it very good and powerful. Best strainer is a muslin/thin cotton bag. I made my own with muslin I bought from the market, just sewn a piece of muslin together to form a bag. Usual size I normally made is about 30cm X 24cm. Below is a picture of this bag. Muslin bag can strain the milk without any pulp at all. If you use a sieve, it is difficult and fiddly to extract maximum milk and there will always be bits of pulp grits in the milk making it tastes gritty. If there is any pulp in the milk, it is likely to stick to the bottom of the pot too during boiling. 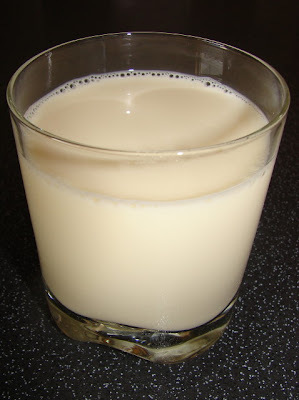 Here is the recipe how I make soy milk at home. Measure the water and set aside. 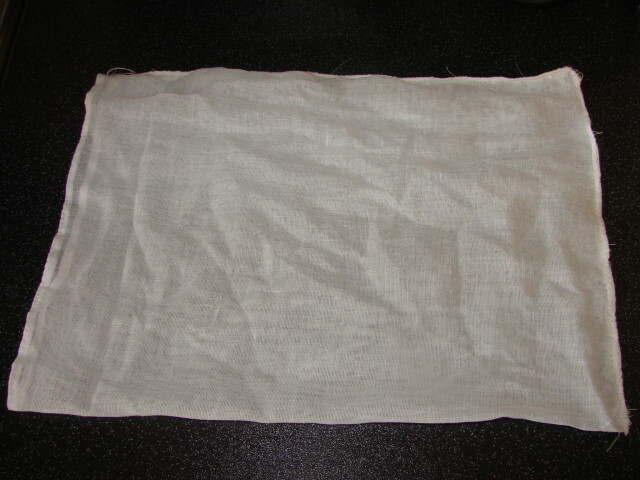 Rinse the muslin bag and wring dry. Fill the liquidiser to about 1/4 full with beans then top up with water to about 2/3 full. Never fill more than 3/4 full or the milk will spill. Turn the machine on to maximum and let it pulverises the beans for about 1 full minute till the beans turned to a thick milky slurry with very fine pulpy grits. Pour the slurry into a large pot or container. Repeat step 4 till all the beans are pulverised. Any left over water add to the bean slurry. Stir. Put the stock pot in the sink. Muslin bag in the pot. Peg the edge of the muslin bag onto the side of the stock pot, with one hand stretching it wide open, then pour/ladle the liquidised soy slurry into the bag to about 2/3 full. Hold the bag tight and remove peg. Twist the top end and squeeze the bag to release the milk and wring till the pulp is as dry as possible. Remove pulp (throw it away or add to cooking if you wish). Continue straining the bean slurry with the bag to extract all the milk. Clean the bag thoroughly inside out. Strain the milk again through the muslin bag to remove any last trace of gritty bean pulp. Pour milk into a clean stock pot (best use aluminium, take less time to boil). There may be a lot a bubbles on top, don't worry about them. Boil at medium heat, cover with lid for the 1st 10 -1 2 minutes, then stir with a slotted spoon and scrape the bottom of pot. Continue boiling, with or without the lid, do not leave the kitchen. Stir and scrape the pot bottom every few minutes till milk beginning to boil. Watch the pot of milk like a hawk, if not you may end up with milk boiling all over, making such as mess minus 1/2 pot of milk left! After it starts to boil with lots of bubbles, turn heat down to minimum and continue boiling and stirring for another 5 minutes. Then milk is ready, heat off, lid on and let it cool. You can use a fine small sieve to remove any solids in the milk, just dip the sieve into the pot of milk and move it around to remove any solids. Pour into bottles or container and store in fridge, use within 4 - 5 days. Without stirring and scrapping, milk sold will start to build up and stick to the bottom of the pot. Milk solid is a pain to clean. Also if your do not scrape any build up on the pot bottom this will get thicker and likely to burn which will give a nasty burn taste to the milk. Stirring the milk is important to ensure milk skin does not form on the surface. Milk skin is stringy and not very pleasant. Stirring also helps to break down the bubbles collected during milk extraction and boiling. For more details in pictures how to extract milk see slideshow on this thread how to make tofu, same principle. Serve milk hot, warm or cold to your liking. To add flavouring to the soy milk, can add some ginger juice or boil the milk with 4 - 5 pandan leaves tight to a knot.